Along with energy efficiency taking people out of fuel poverty, the objective is also to deliver “lifetime homes” that can be adapted to give independence within the existing family home. The concept of Lifetime Homes was developed in the early 1990s by a group of housing experts, including Habinteg Housing Association and the Joseph Rowntree Foundation. The group was formed because of concerns about how inaccessible and inconvenient many homes were for large sections of the population. 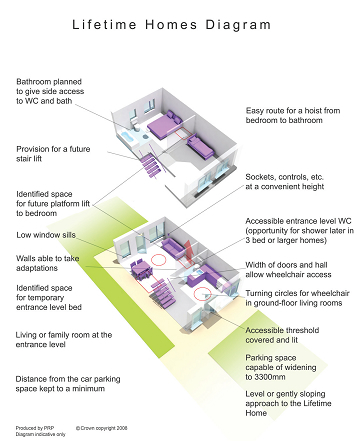 The principles of Lifetime Homes have supported the growing demand for choice, flexibility and independence among disabled people of all ages, as well as promoting high quality and thoughtful housing design for the general population. Lifetime Homes are ordinary homes incorporating 16 Design Criteria, below, that can be universally applied to new homes at minimal cost. Each design feature adds to the comfort and convenience of the home and supports the changing needs of individuals and families at different stages of life. Lifetime Homes are all about flexibility and adaptability; they are not ‘special’, but are thoughtfully designed to create and encourage better living environments for everyone. From raising small children to coping with illness or dealing with reduced mobility in later life, Lifetime Homes make the ups and downs of daily living easier to manage.